I was exhausted when I woke up this morning (thanks to a teething nine-month-old) but then I saw this, and felt ready to embrace the day. It’s a free e-book called Glossodahlia. 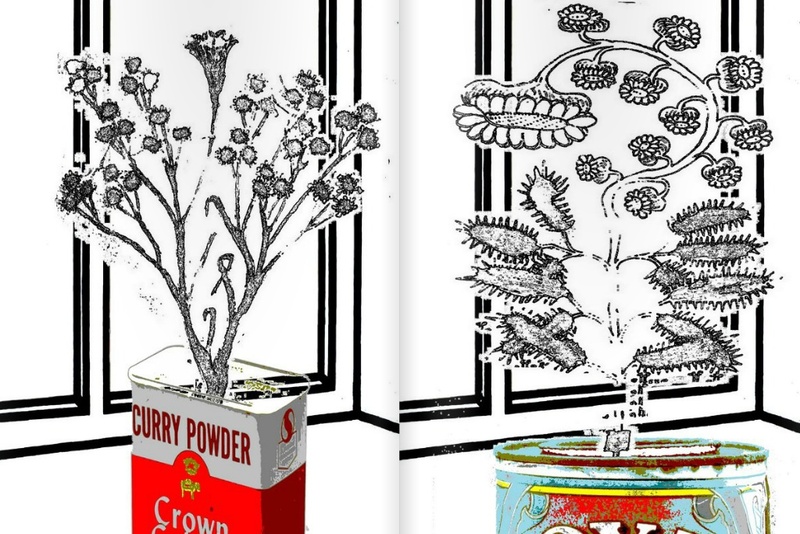 On its pages, strange and wonderful plants blossom from battered, retro tins and cans. 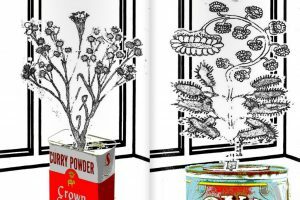 The flowers are taken from the pages of the Voynich manuscript, a 500-year-old text filled with drawings and writings in a mysterious language that is either a hoax, or one of the most ingenious codes ever. The Voynich manuscript has been decoded. Its flowers have given up their secret. They speak in tongues – glossolalia. And they tell stories of brokenhearted cosmic lovers and of a retired intergalactic bureaucrat as she tends to her garden once baking is done. I love how Chemaly mixes the mystery and romance of a faraway galaxy with the comforting smell of home. It makes me think that the human imagination is a wonderful thing. I have heard of the Voynich manuscript (very peculiar! ), thanks, I will take a look at this.